Nazi hunters Ian Graham and Tony Rodomovsky are determined to find a woman suspected of committing atrocities during World War II. Known as the Huntress, or "die Jäguerin," she is elusive, but the more they dig into her past, the more clues they uncover. The Huntress, meanwhile, has escaped Europe and is hiding in Boston with her new husband, Dan, and his grown daughter, Jordan. 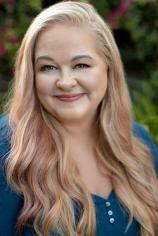 Even though Jordan is happy her dad has found love again after the death of her mother so many years ago, there’s something not quite right about her new stepmother. Is Anna really the refugee she proclaims to be? Or is there more to her story? Will the hunters find their prey before she disappears yet again? 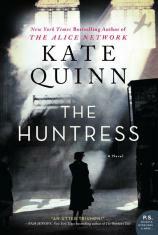 After loving Kate Quinn’s THE ALICE NETWORK, I couldn’t wait to read THE HUNTRESS. Lucky for me, it did not disappoint; in fact, I loved this one even more. "Be sure to set aside a good chunk of time before opening THE HUNTRESS because you definitely won't want to abort/bail on this powerful, moving account of the aftermath of war before zeroing in on the dramatically satisfying conclusion." After being introduced to Night Witches, female military aviators in the Soviet Air Force, a year ago in DAUGHTERS OF THE NIGHT SKY by Aimie K. Runyan, I was eager to learn more about these courageous women via protagonist Nina Markova. I enjoy reading about strong female characters, and Nina was definitely a force to be reckoned with serving under Marina Raskova, a real-life Hero of the Soviet Union and their most famous female pilot. I love when real, historic figures are woven into narratives because it makes the story more authentic. Although fictional, Nina was larger than life and her backstory was one of my favorites. Since I've read numerous books about WWII, I liked that THE HUNTRESS focused mostly on the aftermath of the war rather than the war itself. Fans of historical fiction will appreciate this richly detailed, highly suspenseful, barrel-rolling adventure around the globe. I held my breath during a few pivotal scenes, especially throughout the conclusion. For romance enthusiasts, there were a few love stories sprinkled in, but in my opinion, they did not detract from the main story about the Nazi hunters’ search for Anna. Yes, this 530-page book is long, but it’s well worth your time. I felt utterly immersed in the complex, multi-layered story and very much connected to the well-fleshed-out, multi-dimensional characters as they formed friendships, enjoyed camaraderie and faced their biggest fears head on. At times, I was so lost in the novel that I felt somewhat dazed when I had to stop reading. Be sure to set aside a good chunk of time before opening THE HUNTRESS because you definitely won't want to abort/bail on this powerful, moving account of the aftermath of war before zeroing in on the dramatically satisfying conclusion. See what I did there? Luckily, I was able to devour it over a long weekend while my husband and son were out of state for a soccer tournament. As soon as I recover from this extreme book hangover, I look forward to sinking my teeth into the rest of Quinn’s backlist. Last but not least, I would highly recommend reading the author's note as it explains which characters were based on real people. This, in my opinion, added even more depth to the story.